Belarus-based seafood producer Santa Bremor has selected RPC Superfos’ UniPak container with an in-built strainer to pack a new range of seafood products in brine and oil. The injection moulded polypropylene UniPak container is being used by Santa Bremor to pack seafood products including mussels, shrimps, octopus and seafood cocktails. Santa Bremor new seafood ranges comprise a variety of seafood preserves packed in 500g and in 95mm UniPak containers. It offers products in Belarus, Russia, Ukraine, Kazakhstan and Moldova. The UniPak, which is easy to open and re-close, is integrated with a liquid-tight snap-on lid. It also has a visible deterrent to tampering as standard. Santa Bremor brand manager Angelina Averina said: “We opted for the pack with a strainer because it makes it easy for consumers to take some seafood from the container and leave the rest in the brine or oil for later consumption. “Our product remains juicy, tastes better and also stays fresh for longer when it is kept in the liquid in the fridge. The pack’s artwork is made using in-mould labelling technique, including an infographic explaining the benefits of the strainer. 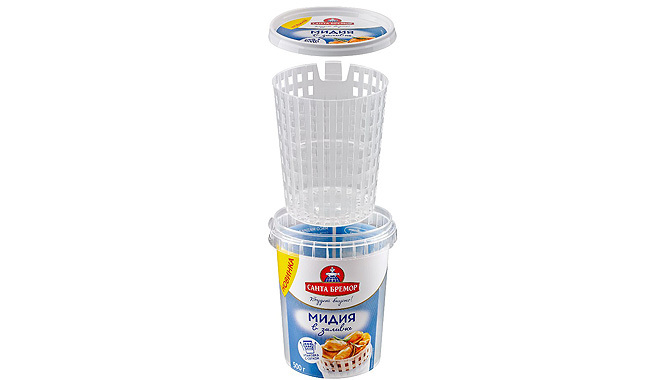 Additionally, the strainer, which comes with the pack, is made of the same material as the pack. Angelina added: “The size as well as the cylindrical shape is ideal for our customers. The strainer represents a clear advantage, because it makes sure that we stand out from our competitors. Currently, Santa Bremor provides more than 500 product types through trade representatives in more than 80 cities worldwide. Image: Santa Bremor’s new seafood range packed in UniPak container. Photo: courtesy of RPC Group Plc.